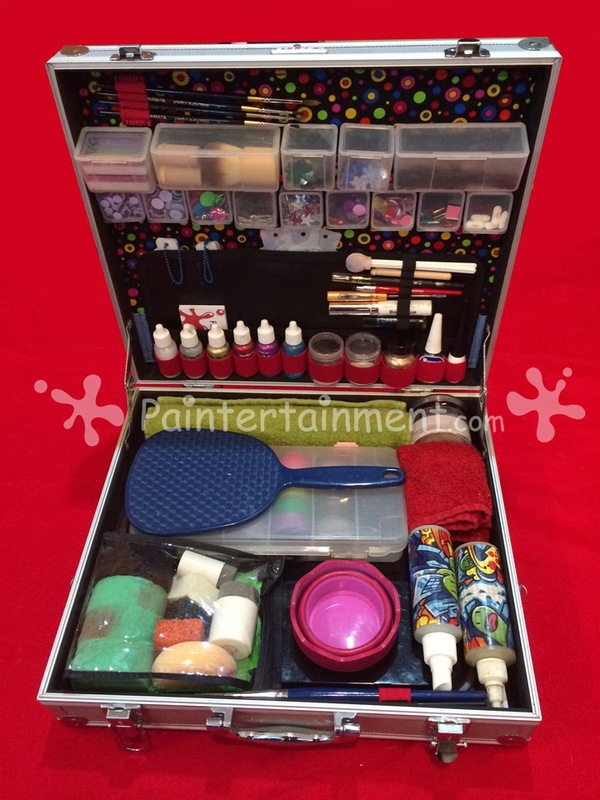 Paintertainment: Thrift Store Remake: My New Compact Kit! My new super compact kit! When I came across this aluminum case at Goodwill for $6.99, I of course HAD to pick it up and turn it into a sweet kit!! It was in excellent condition and even came with a set of keys to lock it. The first thing I did was pull the cardboard base lining out. It had some vinyl pieces on it that were designed to secure whatever this case originally held, which I saved and ended up re-using. (the Velcro, too!) This piece pulled out pretty easily. Ripping out the lining. I left the black foam sheet in the top half. 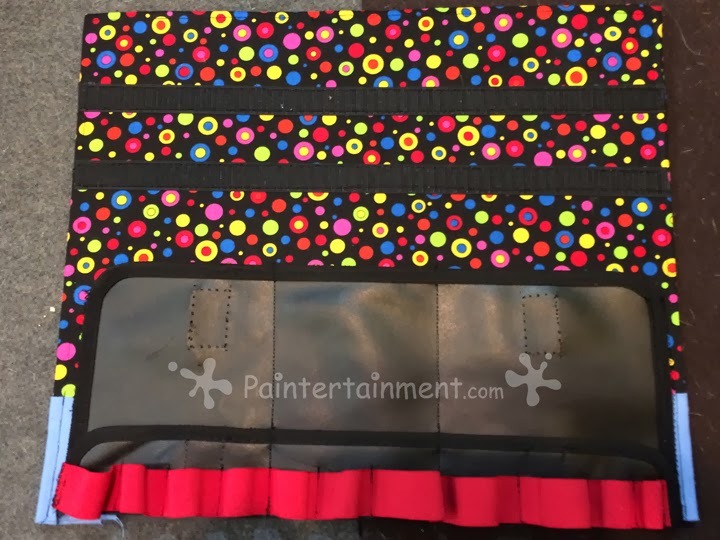 I bought the fabric, elastic, and velcro, and then re-used those black vinyl pieces as pockets. It was pretty easy to just run this cardboard with the fabric through my sewing machine which worked great. The velcro is positioned just right for some small plastic containers I used (see below), which I found at Michaels (in their bead storage). 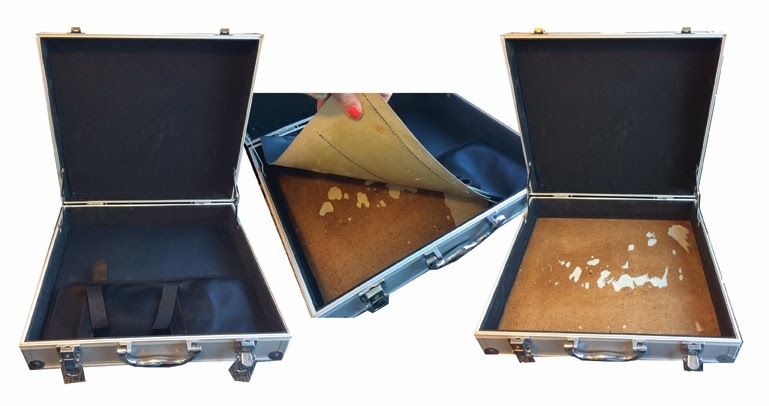 I then put some velcro on the back of this piece, with the other pieces on the inside of the case lid, so that I could velcro the whole works to the case. I don't know if I'll ever remove it, but if I ever want to sew anything else on, or even swap out the whole deal with a new setup, it'll be super easy now. In the base of the case, where I pulled up the cardboard, it looked ugly. But, I covered that with a black towel (cut to fit, and hemmed), which also attaches with velcro. This way I can pull it out and toss it in the washing machine if when it gets dirty. 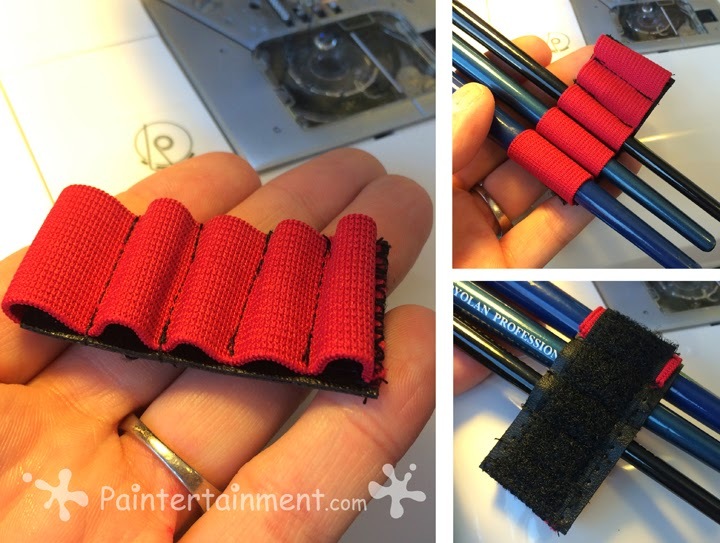 For my brushes I sewed some velcro to the back of one of the leftover scraps of vinyl, and then added red elastic to the other side, creating loops to stick the brush handles through. 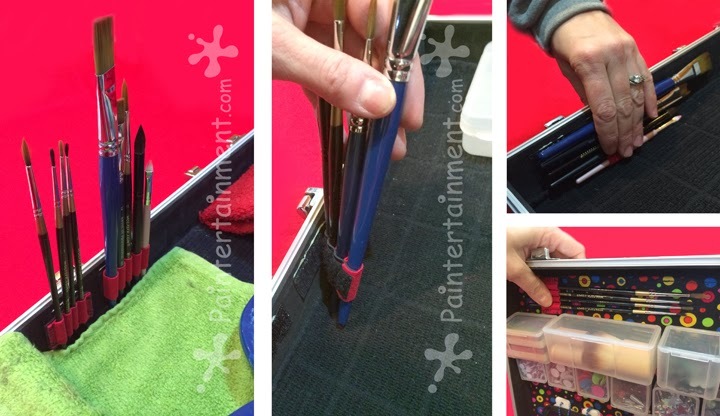 I then was able to add the other half of the velcro to my case wherever I wanted to mount my brushes. The velcro enables me to put my brushes in one spot to pack them away, and then move them to another spot to make them easy to access while I'm working. Above you can see the brush position when in use (far left), the brush holder being removed (center), and the two brush holders being fixed into position when packing up my kit for travel (right). I positioned the velcro strips across the back at just the right height (below) so that I can have these larger containers open while I'm working. In those I have my bobby pins, daubers, kabuki brush, and some larger gems. When I'm NOT using the kit, that top space is where I can mount my brushes to keep them safely packed up. Below the larger plastic containers I have some smaller ones that I only open when I need them. They hold my various gems, google eyes, metal tips and pins for my Liquid Bling, and even one with a few Tylenol. Nobody likes being stuck with a headache at a gig! ;-) I had the worst time finding adhesive that would stick the velcro to these containers. I tried super glue, some special Velcro adhesive, 2-part expoxy and Gorilla glue. NOTHING worked...I even tried roughing up the plastic with sandpaper, and the velcro just popped off like nothing. I finally tried some "extreme" foam tape by 3M and that seems to be working! Below is a photo of the kit open, and all of it's contents spread out. You can see that it holds a LOT of gear for a small space!! 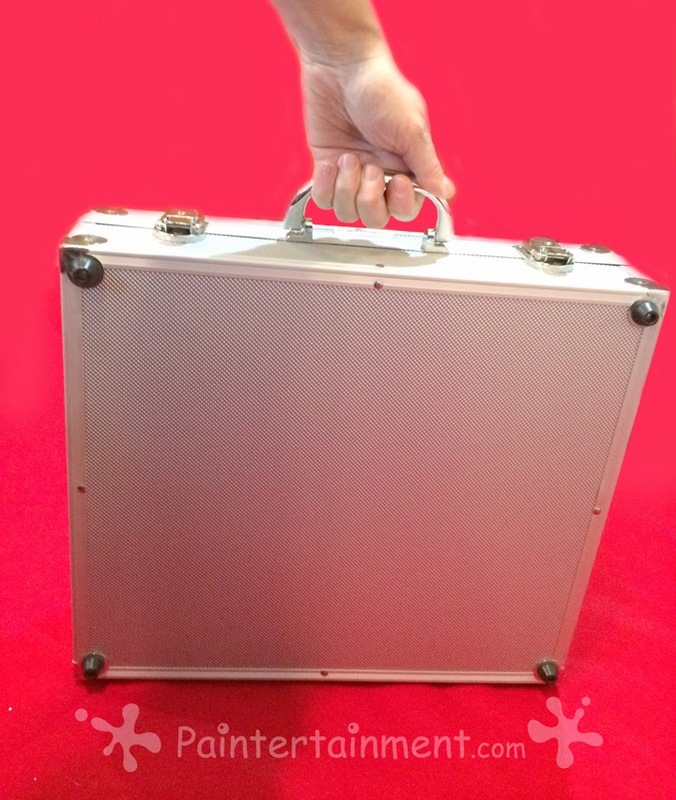 Below you can see how everything fits inside the kit. An assortment of my liquid bling, glitter, metallic powder, adhesive, and Detailz sit nicely along the bottom of the lid in their red elastic loops. Above my glitter I have more elastic loops that hold my lollipop blenders, small dauber, dotting wand, Mehron pencil, mini screwdriver (I use to mix my paints), body glue, and a chapstick sushi horizontally. The flat pockets hold my business cards and BAM stencils. All of my supplies packed away! In the base of the box I have another plastic box that holds my small screw-together jars of paints. Behind that I have my larger cakes, all screwed together and rolled up in my green washcloth. Wolfe black and white are in the upper right corner. Under that is another small washcloth. My mirror sits on top of my paints. I have a little plastic zipper pouch on the lower left corner, which holds my makeup remover wipes, an assortment of sponges, and daubers. The pink circle is a cool collapsible cup for my rinse water. (I may buy another so I have two rinse pots though) On the lower right corner are my two water bottles. I like a spray bottle and a dropper bottle. I may find smaller ones for this kit though. A palette of Mehron INtense Pro pressed powders sits under the cup, and underneath everything is my towel-lined (with velcro again) paint tray and my design sheet. 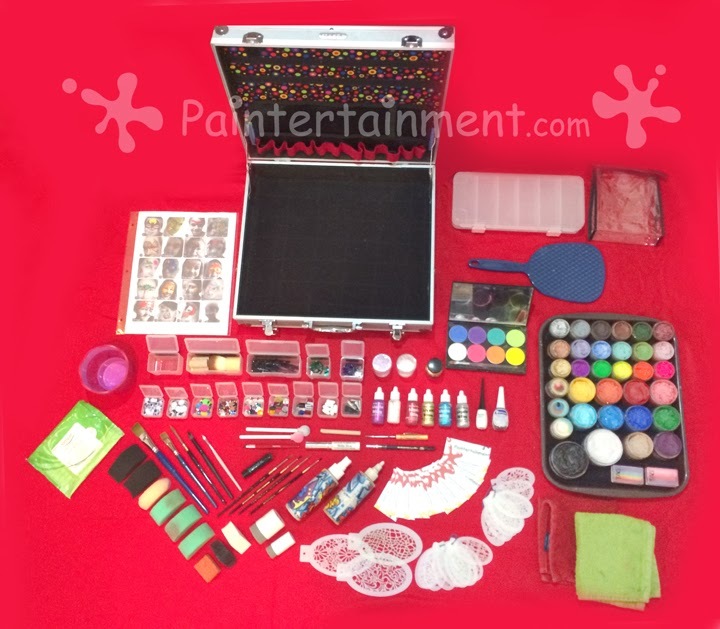 Above is a photo of the kit all opened up and ready to paint with. My brushes are mounted upright in the lower right corner, my mirror is poised handle-out, ready for me to grab for the big reveal! I have my green wash cloth under my water cup, draped over the edge of the kit to soak up any drips that may fall off my brush while I'm painting. Everything else is pretty much already on display which I love! Update January 2015: I still LOVE this kit! I did get a deeper case though that can hold my bulky brush tub, so I use that one more currently. But, I'm exploring options for smaller brush tubs so I can go back to this. I've also since created an entire playlist on YouTube of videos showing my kits in detail. Check them out HERE and don't forget to subscribe to my channel for the latest! I'm CONSTANTLY working on improving my kits! Check out my channel to see tours of my pocket sized kit, my travel kit, and a time lapse of me creating one of my insert panels. Very nice! 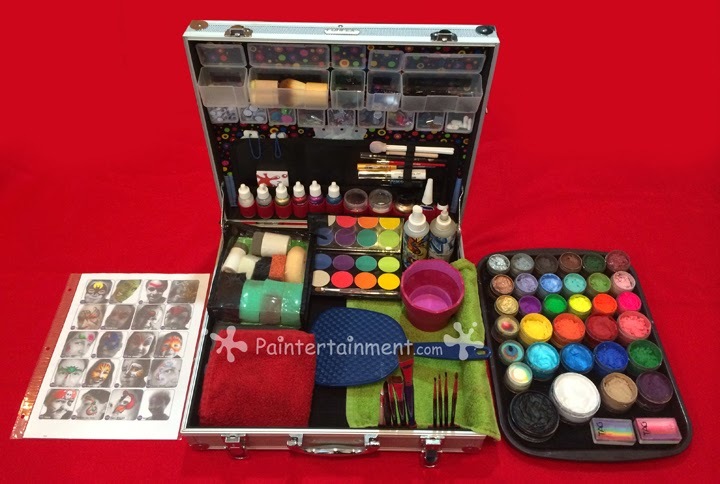 do the paints fit inside the case too? 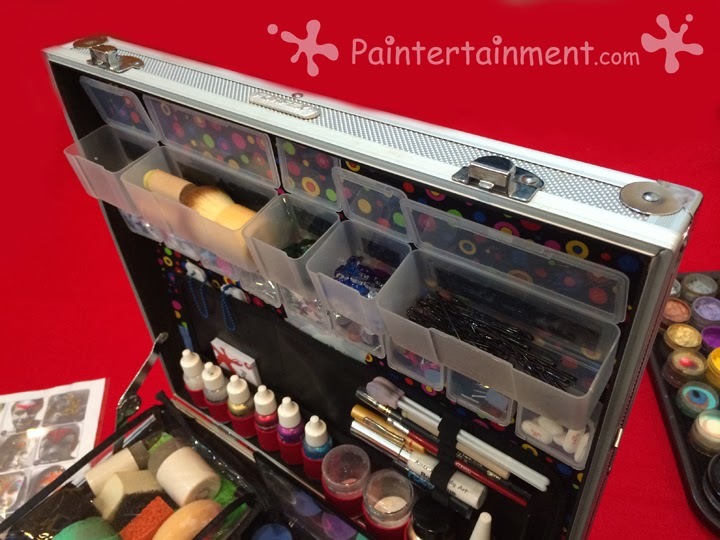 I like how you have the Velcro near the front of your case for the brushes! Did you repot your paints into the screw together pots?